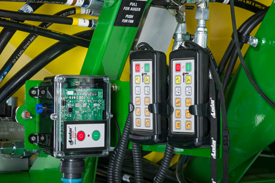 Air systems are color coded (optional) in order to more conveniently connect the air distribution kit from the 1910 Cart to the seeding tool. 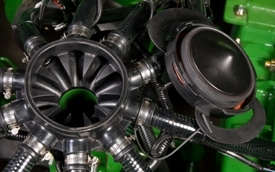 Black hoses are typically used for seed and green hoses for fertilizer. The 25-mm (1-in.) 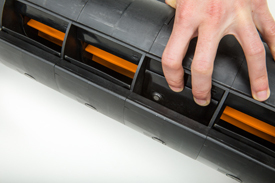 secondary lines are clear with a black spiral (clear with a green spiral is available with the double-shoot air kits). (14 to 26-gpm) oil flow for operation. Growers around the world are always looking for ways to become more productive. 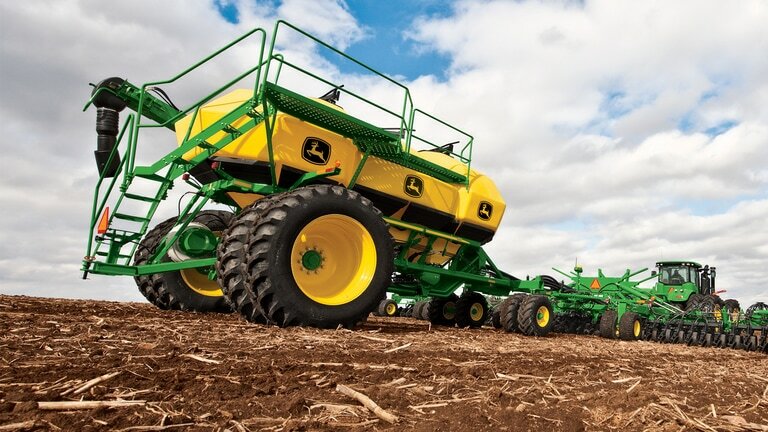 The John Deere Seeding Group is continually looking for ways to help these growers increase productivity. The 1910 Commodity Cart is one of the best ways to maximize productivity. 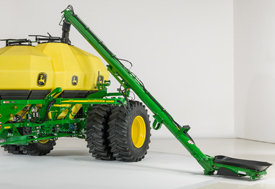 By providing growers with several different tank configurations, the 1910 Cart allows growers to get the most benefit from input costs and time in the field. *Assumptions: cubic metre (1000 litres) of: wheat (front tank) = 0.76 tonnes, urea (middle tank) = 0.73 tonnes, fertilizer (rear tank) = 1.10 tonnes, bushel = 35.3 litres. The tank lids are sealed, ensuring proper air pressure within the tank and at the meters. 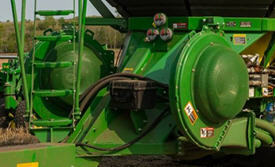 Sealing the tanks improves hydraulic fan utilization, providing efficient and optimum seeding accuracy. With less than 0.13 bar (2 psi) of pressure in the tank, the pressure is equalized between the meters and tanks, providing an accurate, consistent seeding rate. NOTE: Tank volume is measured to heaped capacity. When product is shoveled to the corners of the tank, the tanks may hold more than advertised capacity. 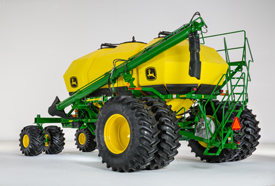 Hydraulic drives are standard equipment on the 1910 air cart starting in model year 2014. They offer consistent drive power to the meters through all meter speeds. They offer many features, including variable-rate drive and hydraulic calibration as standard equipment. Each meter has its own hydraulic drive motor and can be set independently of each other. It is recommended to use power beyond if available or another SCV, if power beyond is not available. The meter rotation is steady and smooth, minimizing pulsing effect. Drives are infinitely adjustable within range. The motor speed is controlled by an electrohydraulic valve mounted on the motor. 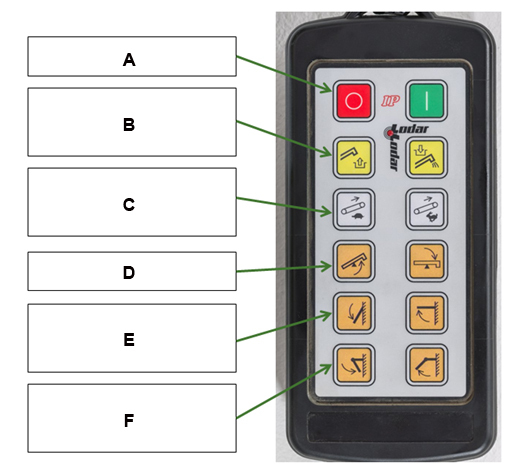 The operator has the ability to shut off all or any one or two of the given meters from the display at any given time. The operator has the ability to select from six different predetermined rates, or utilize variable rate for map-based prescriptions. The system uses wheel speed from the cart to determine ground speed. If the cart wheel speed drops below 3.2 km/h (2 mph), the system will use tractor speed, if available, to maintain proper application rates when in turns or coming out of a headland turn. Hydraulic variable-rate drive is standard equipment for 1910 Carts starting in model year 2014. Meter speeds will change from the slowest to the fastest meter speed almost instantaneously. This will improve the accuracy of variable-rate prescription applications where changing rates quickly are important to the operator. Hydraulic calibration is standard equipment for the 1910 Cart. 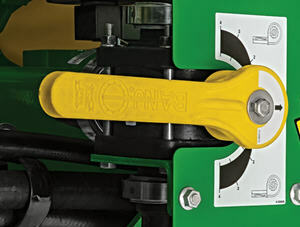 Hydraulic calibration makes it easy for the operator to rotate the cart meters to perform easy and accurate calibration with very little effort from the operator. Similar to the previous hydraulic calibration kit, the operator can calibrate more than one meter at a time. The first part of the procedure prompts the operator to prime the meters by giving the meter rollers two full rotations. The next step prompts the operator to turn the meters until they stop. After completing this step, enter the weight of the product caught during the latter step into the selectable boxes to get the new MDV. Operators can now perform meter verification without driving. In the meter verification page on the display, select the meter(s) to verify and the stationary checkbox. When the operator engages the calibration switch, the meter will turn the number of revolutions to meter out the amount of product for the area selected. 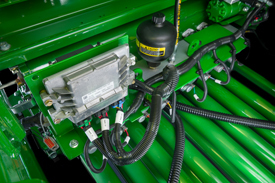 NOTE: It is highly recommended to have power beyond and load sense installed on the tractor hydraulic system to power the hydraulic drives. This feature will save fuel, as well as reduce hydraulic heat, while providing maximum performance by the tractor hydraulic system to the cart hydraulic drive motors. 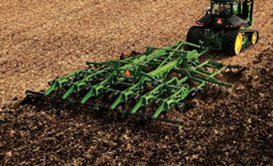 By having load sense, the tractor is only required to provide the pressure and flow that the drives require. 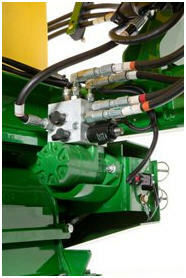 Power beyond and load sense capability have been tested and approved for all 8x00, 9x00, and newer John Deere tractors. Older John Deere tractors and competitive make tractors have not been tested for functionality. If power beyond is not available, an additional SCV will be needed to power hydraulic drives. See link for more information on power beyond kits. The easy-to-navigate staircase and large platform provide easy access to tank lids. The staircase is much easier to navigate than ladders found on other air seeders. Controlling input costs and improving productivity are key producer requirements today. 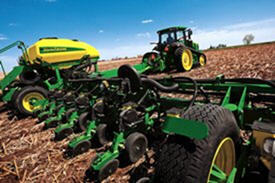 SectionCommand is an effective, integrated John Deere solution designed to meet these intensifying needs. 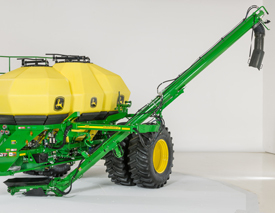 SectionCommand manages both seed and fertilizer application by minimizing overlaps and skips while seeding with the John Deere 1910 Air Cart. 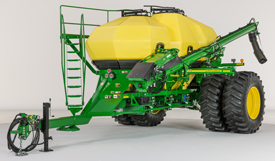 SectionCommand is optional factory-installed equipment on all John Deere 1910 Air Carts. 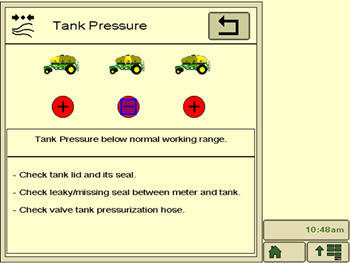 When the option is selected, each tank and meter will receive SectionCommand components. A two-tank cart will control sections out of both tanks and three-tank carts will control sections out of all three tanks. SectionCommand is also available as an attachment for field conversion (AFC) for all hydraulic drive carts. See AFC kit story for more information. 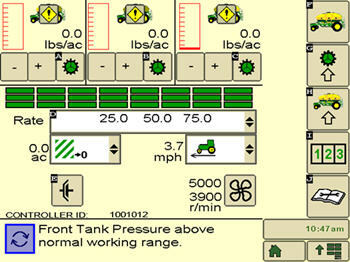 SectionCommand controls seed and fertilizer output by closing and opening gates on the bottom side of the meter. When the gates are open, commodity is metered out, and when closed, commodity stays and continues to rotate within the meter. The meter stays full at all times so immediately when the gate opens, the commodity can flow into the primaries and onto the tool. Since each meter section has its own gate, application rates and row-to-row accuracy are not compromised. The gates are utilized to control commodity output on all sections. Once the last gate needs closed, the entire meter will stop turning, stopping product flow. For maximum performance, SectionCommand should be controlled through John Deere Section Control on the GreenStar™ 3 (GS3) 2630 Display. 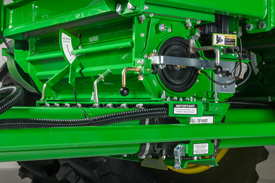 Coupling SectionCommand with John Deere Section Control provides the ultimate in precision seeding and productivity. If a Section Control activation is held by the producer, that same activation can be utilized for SectionCommand. All data is collected on the display and can later be reviewed in Apex™ farm management software or the John Deere Operations Center, where it can be shown in the form of maps and reports. 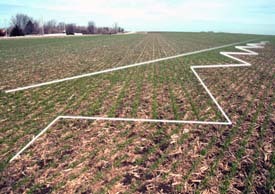 The GS3 2630 Display can be used to document tillage operations. The tillage information can be unloaded into Apex farm management software to create maps and reports. 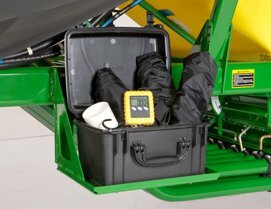 The GS3 2630 Display can be used to document product applications on John Deere sprayers and spreaders. The application data can be unloaded into the John Deere Operations Center or Apex farm management software for reporting information. Operators can use the GS3 2630 Display to document seeding rates and varieties and instantaneously field data is written to the display which can later be used to make more informed decisions. The GS3 2630 Display is capable of documenting up to six unique varieties. 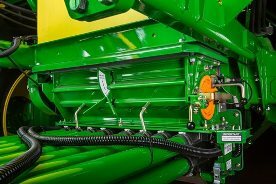 For SeedStar™ planters with three hydraulic drives, one variety follows the left-most hydraulic motor. Another variety follows the two right motors. 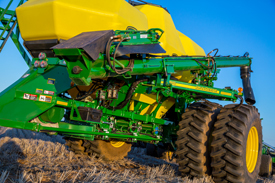 For SeedStar planters with an equal number of hydraulic drives, varieties split following the left and right drives. 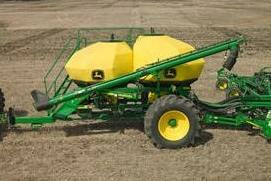 For non-SeedStar planters, the implement width is split in equal halves follows the left-most hydraulic motor. Another variety follows the two right motors. Documentation of field operations remains important regardless of controller brand. The GS3 2630 Display is capable of communicating with selected third-party controllers. Collectively, the system supplies the operator with instantaneous data while logging it to a data card. This information can be downloaded into Apex Farm Management software for further analysis and reporting. 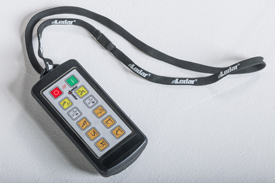 When using Raven, Rawson®, or New Leader® controllers, the Field Doc Connect system is also capable of running in conjunction with map-based prescriptions. DICKEY-john and Seed Manager are trademarks of DICKEY-john Corporation. New Leader is a trademark of Highway Equipment Company. Raven SCS 440, Raven SCS 450, Raven SCS 460, Raven SCS 660M, and Raven Sidekick are trademarks of Raven Industries Incorporated. Rawson, ACCU-RATE, and ACCU-PLANT are trademarks of Trimble Navigation Limited Corporation. Vanguard VM-2500 Precision Information Center and Vanguard VM-2500SE Precision Information are trademarks of Agri Motive Products, a division of the Daugherty Companies Incorporated. 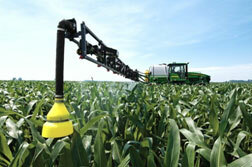 TeeJet is a trademark of Spraying Systems Company. Cart brakes are an option with 430 Tow Between, 430 Tow Behind, and 550 Tow Behind Carts. The brakes are required when using a 23-m (76-ft) 1870 tool. 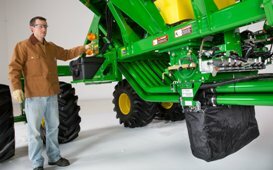 The air cart hydraulic brake system connects to the tractor’s hydraulic system through a brake connection at the rear of the tractor. Tow behind carts require an extension hose for the air seeding tool. 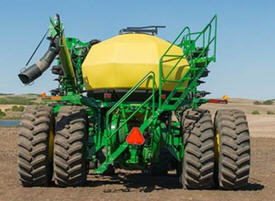 Conveyance on 350-bu, 430-bu, and 550-bu carts is now controlled by hydraulic cylinders on the conveyance arms. The cylinders move the main arm, swing arm, and elevation. Now operators can easily deploy the conveyance system with less effort. 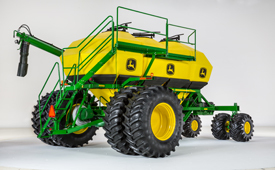 For operators who fill carts from semi hopper bottoms or who desire full width meter clean out, John Deere has partnered with KSi™ Conveyors to provide a low-profile hopper. 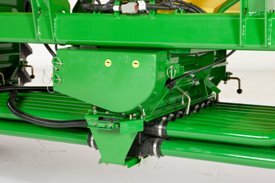 The hoppers are compatible with all hydraulic conveyance carts. 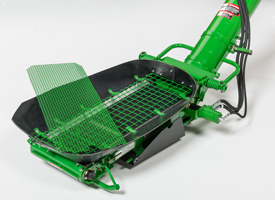 The hoppers utilize conveyor belts and are available for both the 255-mm (10-in.) auger and 305-mm (12-in.) conveyor. 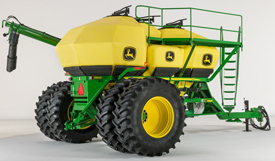 The hoppers are longer than competitive offerings on similar cart sizes. KSi is a registered trademark of KSi Conveyors, Inc. 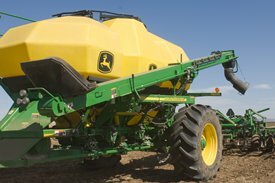 It is simple: Less time filling means more time seeding. As growers look for ways to increase efficiencies, one solution is to shorten the time required to fill. By increasing pit stop productivity, growers are able to cover more ground per day. 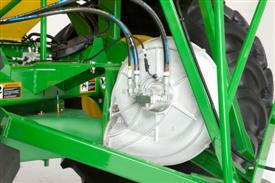 A meter cartridge at each compartment (tank) effectively meters seed or fertilizer into the primary manifold. 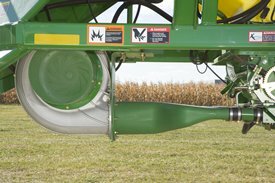 Air carries the material to the secondary distributor for delivery to the furrow openers on the seeding tool. Meters are contained in a cartridge for quick and easy removal and are color coded for quick and easy identification. 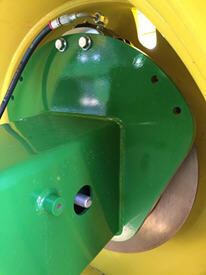 AirPower 2 now provides two independently controlled fans – one for seed, one for fertilizer. Along with large 76.2-mm (3-in.) 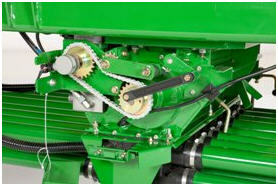 primaries, more accurate delivery rates are possible across the full width of the seeding tool – from opener to opener. Plus, AirPower 2 allows growers to deliver high rates under field operating conditions – up to 40 percent more product delivery per primary compared to the single-fan system. 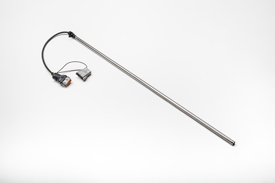 Dual fans are required for tow-between and tow-behind carts on the 23.1-m (76-ft) tool with eight primaries. Each fan will direct air to one set of primaries. Two selective control valves (SCVs) are required for the fans. The fan speed will be controlled through the SCV flow control. AirPower 2 will also be compatible with the current 17-m (56-ft) 1870, as well as the 13-m (43-ft) 1895, plus the 15.2- and 18.3-m (50- and 60-ft) 1890 models. An option is available for stainless-steel primaries – to resist corrosion from high fertilizer rates. There is a slide at the meter to choose bottom or top shoot for each meter. 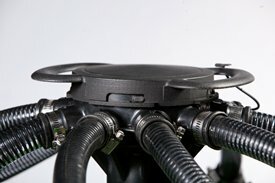 There is also a valve on the tank pressure system to choose top or bottom shoot. This same valve is also used to adjust the amount of air to the tank to create the proper pressure differential. The arrow on the valve handle should be pointing to the top of the range for the top shoot and the bottom of the range for the bottom shoot. If the tank will not be in use, set the pressure valve to the middle setting to not pressurize the tank. The operator should use the gauge to find the correct setting. An electronic pressure sensor will send a warning to the display if the tank pressure differential is out of range. The electronic pressure sensor is located behind the mechanical gauge on the side of the cart. *Only applies to 1910 AirPower 2 Carts as the C850 Cart is only compatible with the Gen 4 CommandCenter™ display. Type Hydraulic motor, 26.5 USGPM @ 5000 psi max.